These can be used on the larger gas hulls of approximately 40" or greater. Made with high quality aluminum, CNC cut to tight tolerances. These come with a cross drilled strut bushing for a .250 (1/4") prop shaft. These can be bought with Hydro(short) or Mono(long) brackets. The Hydro bracket will have the nose cone of the strut under the hull. The Mono bracket will have the nose piece close to the transom. We carry these in two styles. Flat bottom strut for added ride area on the strut. or Traditional Round Bottom strut. 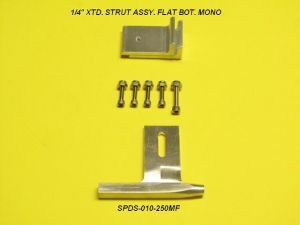 You may have seen this strut elsewhere for a lower cost, the difference is OSE packages these with the .250 brass bushing which most all the other companies out there DO NOT! This is set the drive dog approx 3" from the transom. .250(1/4") Strut requires K&S# 8133 5/16" brass stuffing tube.